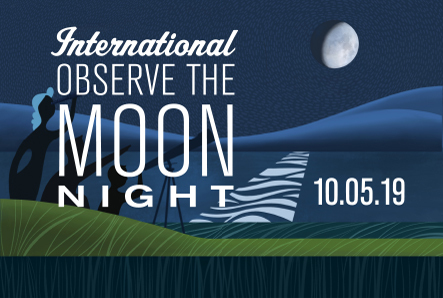 NLSI recently reported that NASA’s Lunar Reconnaissance Orbiter (LRO) spacecraft had returned data that indicated ice may make up as much as 22 percent of the surface material in Shackleton crater. Here we report in more detail on the paper by NLSI’s Brown/MIT team, Zuber et al. (2012). 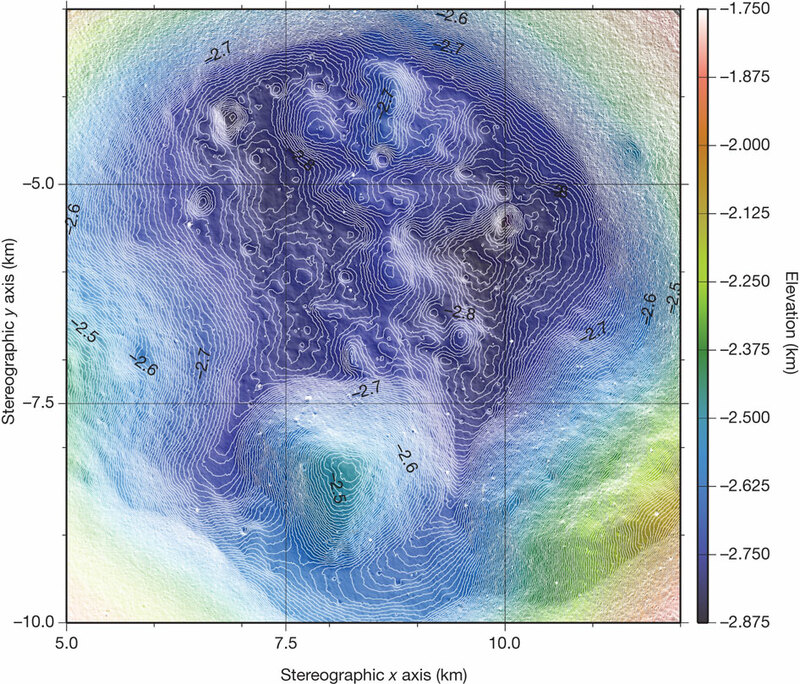 Constraints on the volatile distribution within Shackleton crater at the lunar south pole. Nature, 486, 378­381. Shackleton crater is nearly coincident with the Moon’s south pole. Its interior receives almost no direct sunlight and is a perennial cold trap, making Shackleton a promising candidate location in which to seek sequestered volatiles. 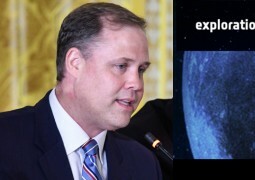 However, previous orbital and Earth-based radar mapping and orbital optical imaging have yielded conflicting interpretations about the existence of volatiles. 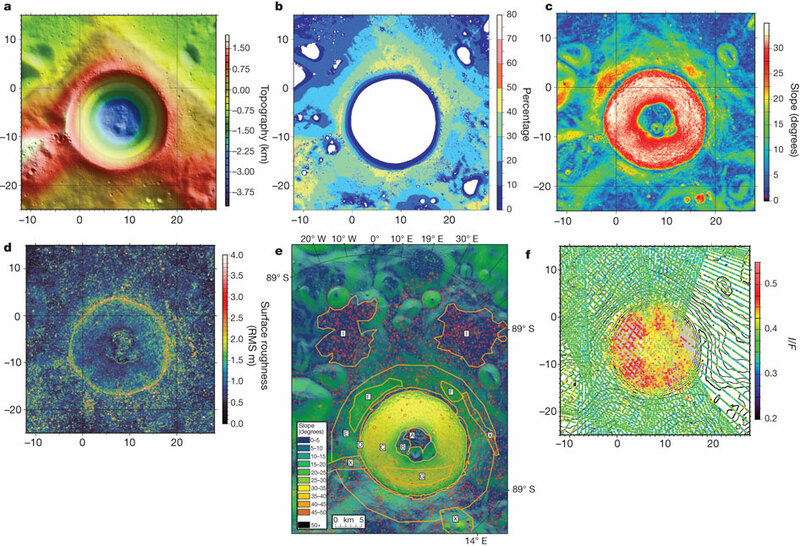 This paper presents observations from the Lunar Orbiter Laser Altimeter on board the Lunar Reconnaissance Orbiter, revealing Shackleton to be an ancient, unusually well-preserved simple crater whose interior walls are fresher than its floor and rim. Shackleton floor deposits are nearly the same age as the rim, suggesting that little floor deposition has occurred since the crater formed more than three billion years ago. At a wavelength of 1,064 nanometres, the floor of Shackleton is brighter than the surrounding terrain and the interiors of nearby craters, but not as bright as the interior walls. The combined observations are explicable primarily by downslope movement of regolith on the walls exposing fresher underlying material. The relatively brighter crater floor is most simply explained by decreased space weathering due to shadowing, but a one-micrometre-thick layer containing about 20 per cent surficial ice is an alternative possibility. Detailed study of the topography of Shackleton (Fig. 1a below) offers the opportunity to improve understanding of processes that operate in permanently shadowed regions (Fig. 1b below). Crater geometry, age and preservation state are relevant for understanding the accumulation and preservation of volatiles as well as the processes that modify the lunar surface over geologic timescales. a, Topography in km; b, percentage of time illuminated; c, 10-m baseline slopes in degrees; d, surface roughness shown as RMS residual in m; e, locations of crater counts used to determine relative ages; and f, zero-phase, 1,064-nm reflectance shown as I/F. Topography, slopes and roughness are based on a 10-m spatial resolution grid of all available LOLA profiles. In a–d and f, x and y axes indicate spatial scale, where (0, 0) is the lunar south pole and colour scales show magnitude of plotted quantity. White regions in b correspond to zero illumination. Panel e shows locations of craters counted to estimate relative age, plotted over 10-m slopes (colour coded as in inset). Crater regions in e correspond to: A, flat region of crater floor; A/B, entire crater floor; C, crater wall; D, crater rim crest; E/F, inner rim annulus (~5.5 km); E, inner rim annulus excluding steep region (F); F, steep rim region within annulus; G, crater wall section; I, Shackleton crater deposits north of rim in flat areas; and X, secondary crater chains and clusters (removed from analysis). In f, reflectance is expressed as a radiance factor (I/F), which is defined as the ratio of the measured radiance I to the radiance F of an ideal diffusive surface in vacuum with 100% reflectance under the same illumination. Each dot represents a 0.4 × 0.4 km pixel median average of LOLA’s spot 3 reflectance. Contours show topography at 0.2 km intervals. The grey annulus shows the 17-km diameter of the steepest portion of the walls and the 7-km diameter of the floor. Figure 2 shows a more detailed view of the topography of Shackleton’s floor, which highlights the irregularly distributed deposits and numerous small craters (see also Fig. 1e). The largest mound of material has a relief of ~210 m and the highest-local slope of any of the floor deposits is ~25°, which is below the angle of repose. Two areas of the floor show fan-shaped structures consisting of material that has been transported downslope from the interior walls in a manner commonly observed in craters of this size range. The limited fan material around the margins of the crater floor, combined with the asymmetric distribution and slope properties of deposits, suggest that the predominant contribution to the fill is ejecta fallback with a secondary contribution from slumped wall deposits. Figure 2: High-resolution elevation map in stereographic projection of the floor of Shackleton. Elevations are contoured at 5-m intervals with colours indicating elevation with respect to 1,737.4 km. The axes indicate spatial scales. Read the entire paper in the journal Nature.